Around the Table Book: Hilarious Hospitality! Today's post is written by my friend, Nikki Rogers. This could probably be included in the book I frequently write in my head "Things I Never Thought I'd Do as a Missionary." 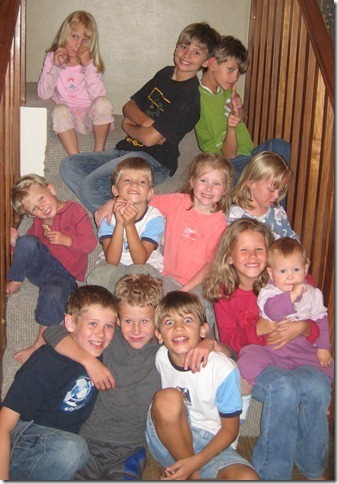 In April of 2009, we enjoyed a visit from Colombian missionaries and friends from our Bible college days and their six children in our home outside of Quito, Ecuador. The Twelve MKs in the House! Our family likes to read from a devotional book after breakfast. So after our first breakfast with our guests, my husband, Dan, pulled out “The One Year Book of Family Devotions Volume 1” and turned to April 8. He began reading, “ ‘Not again,’ Tanya complained. ‘All we ever do is have missionaries stay at our house...’” He stopped reading. There was the slightest delay while we wondered if Dan had chosen this particular story for that day, then we all broke out into laughter. He had not chosen it and our family still remembers it! The point of the story was to entertain cheerfully and that was easy to do during the rest of their visit. While they were with us, another missionary family (with 4 boys) from the coast needed a place to stay in Quito. We did a little more squeezing and used all four of our bedrooms and lots of floor space! Nikki Rogers lives in South America with her husband, Dan, and their two children. She keeps busy cooking most things from scratch and enjoys being a homeschooling mom. If you are interested in writing a brief, upbeat, story for my blog, see my writers' guidelines. I'd love to hear from you, too.